We have a long history of making cakes for Maya and her family. Six years ago, Maya celebrated her 3rd birthday and Rick made a "messy cake" for her party. It was a fun and colorful cake that Rick designed to look intentionally messy and like it was created by a child. The colors were bold with plenty of contrast. The following year, our client ordered another messy cake for Maya. The first one was such a hit with everyone, she decided to keep the same theme for her daughter's 4th birthday. This time, she asked if Rick could do a pretty "messy cake" in girly colors fit for a princess. We knew that could be a challenge given the theme and colors, but once again, Rick designed her cake through the eyes of a child - a little girl (as best as he could) and we were all happy with the results! Shortly before our book Extreme Cakeovers was released last year, Maya's mother wanted to order a cake for Maya's father's birthday. We were already committed, unfortunately, but wished we could make the cake. 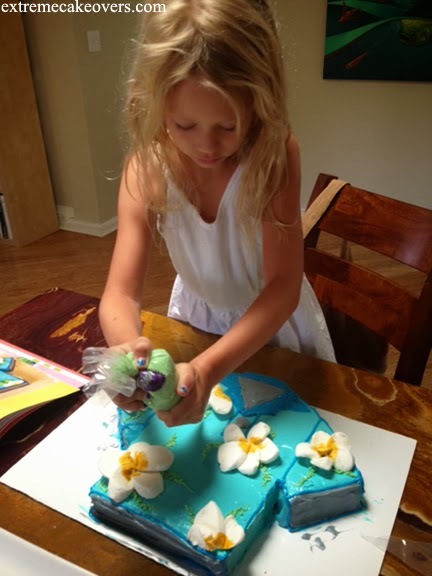 We later learned Maya had made Rick's "Aloha Shirt" cake from our book and her mother sent us some photos. We were blown away by her ability and were so proud of this little girl we have grown to care about! Here is one of the many photos we have. You can view the rest of the photos of Maya making the cake on the Extreme Cakeovers website. Little did Maya know at the time that we already had an order for her 9th birthday cake. We were all so excited about what we had in store for her! 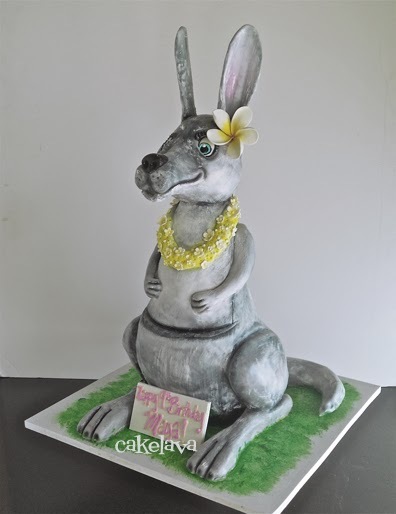 We got the request for the sculpted kangaroo cake while Maya and her family were living in Perth, Australia. Rick and I had visited Australia the year before and had a very special kangaroo encounter in the wild where we got to see and feed dozens of kangaroos. Having this amazing experience would be helpful in making the cake. Since the cake was for a 9-year old, Rick decided to make the kangaroo as cute as could be. 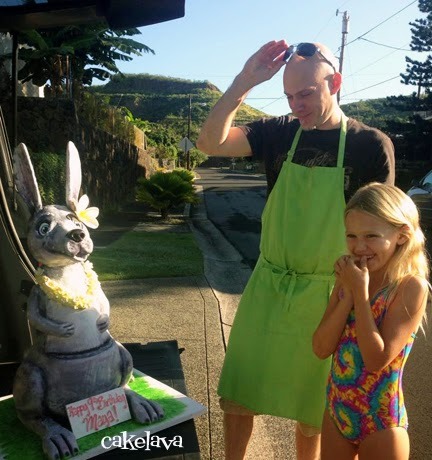 With the family returning to Oahu to live, Maya's mother thought it would be fun to add a Hawaiian touch to the cake, so Rick put a flower lei around the kangaroo and a plumeria flower in its ear. I've said on many occasions, it is always such a pleasure to share in the experience of the "reveal" - when someone sees their cake for the first time. Their reactions are often priceless and it is one of those special moments that remind us why we do what we do. This was one of those moments Rick and I will never forget. When we arrived at the family's home, Maya saw her cake and immediately started grinning and making the cutest giggly sounds. She was in awe of the kangaroo and it was like heaven for Rick and I to be a part of this. Her mother took the photo of Rick and Maya. As you can see, the kangaroo was not small. 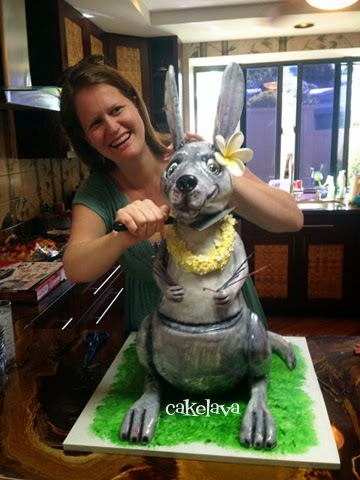 When the kangaroo cake was delivered, her mother made a comment about how she would send the kids into the other room when it came time to cut the head of the kangaroo. We all thought this was hilarious and I visualized a room full of kids running into the next room while the parents beheaded the poor kangaroo. We've heard this many times before that people can become emotionally attached to their animal cakes and don't want to make that first cut. Our client had a great sense of humor about this potentially traumatizing moment and sent us this photo of her laughing as she's about to lop off the kangaroo head. We laughed out loud when we saw the photo, but were also happy we weren't there to have to witness that moment in person. Just as they can grow attached to their cute cake, so can we, and it's hard to see the little fellow go. A huge Thank You to Maya and her family for giving us so many memories over the years. We look forward to many more! Unfortunately I arrived late to the party so I missed seeing the kangaroo pre-beheading, but I can attest that it was so delicious I went back for seconds! We're glad you had a chance to feast on the kangaroo cake and you thought it was delicious! :) Mahalo! I Scream for My Ice Cream Cone Cake!